Part of its ‘Road to Tomorrow Initiative,’ Missouri’s Department of Transportation is teaming with Solar Roadways, an Idaho-based startup (seriously, what’s going on in Idaho?) to cover an undetermined length of Historic Route 66 with road-ready solar panels. “We expect them to be in place, I’m hoping, by the end of this year, maybe before snow flies,” initiative leader Tom Blair recently told the Kansas City Star. Blair also told The Star that the bulk of its efforts will be crowdfunded. After receiving a $100,000 grant from the Federal Highway Administration to build a prototype, and a pair of $750,000 research grants from the US Department of Transportation, the group has raised more than $2 million of its own to complete the project through a crowdfunding campaign on Indiegogo. Solar Roadways’ panels are tempered safety glass that are as strong as they are efficient. In addition to harnessing energy from the sun, they also come with LED lighting to effectively replace road lines and signage. While obviously more expensive to install upfront, the panels do have the benefit of being completely modular, which would allow for quick and cheap repairs by just swapping out the broken panels rather than re-paving entire stretches of road. 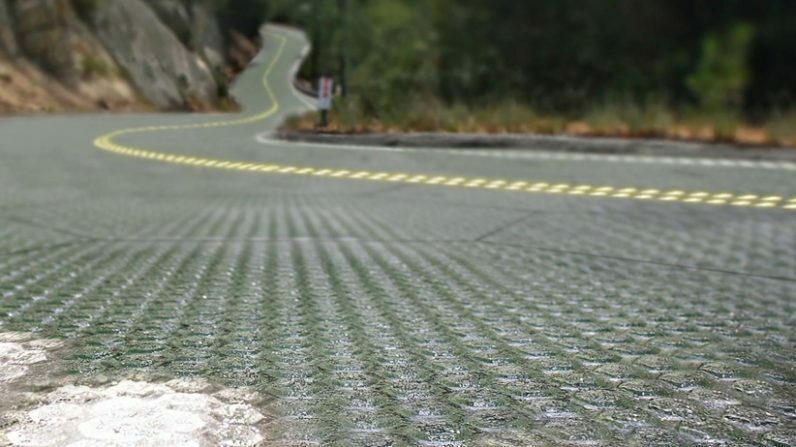 Missouri isn’t the first to experiment with solar roads, but if previous tests are any indication, there’s every reason to be optimistic about the future of the technology.